Building Type(s): Free-standing Hospital Emergency Dept. bldg. and Clinic bldg. The Mercy Emergency North / Mercy Clinic North is a new 23,995 sq.ft. mixed-use, free-standing emergency department (ED) and clinic building designed and constructed for Mercy Health System Corporation. Faced with countless challenges including climate, design, review, permitting, and the fast track of construction relying on timely inspections, this project began with concept plans in July of 2011 and realized a municipal certificate of occupancy in January, 2012. This project serves as a six month success story realized through the collaborative efforts of all stakeholders. This collaborative effort between the design, construction, and regulatory representatives resulted in the on-time delivery of a new emergency and clinic facility that met the owner's schedule. While serving Mercy Health System as the new emergency and clinic building, this facility meets the criteria of health, safety, and welfare in spite of the challenges that were met. Introduced to this project by the owner in the summer of 2011, the State of Wisconsin Department of Health Services immediately recognized the need for a collaborative approach. It was only through a collaborative team effort of all stakeholders that delivering a new freestanding emergency department and clinic building for Mercy Health System could be realized. The State of Wisconsin Department of Health Services (DHS) under State statute is granted the regulatory authority over hospitals. Municipalities in Wisconsin are granted home rule authority under State statute. Specific to building construction, municipalities maintain the right to permit and inspect construction under their jurisdiction. Based on State law, hospital buildings are reviewed and inspected by the Department of Health Services; this is based on the regulatory model that is representative of these facilities. At the municipal level, the health, safety, and welfare are based on the performance criteria outlined by the commercial building code as well as municipal ordinance. Recognizing a "just in time" submittal, review, and approval model that was acceptable to both the State of Wisconsin and the City of Janesville building and fire authority allowed the project to move forward. Under permit with the City of Janesville, the construction progressed as a clinic/business occupancy with the understanding that the final approval as a free-standing ED would be subject to DHS variance approval. Partnering with the City of Janesville building and fire authorities, the team inspections moved forward with the pace of the project while keeping in mind the potential for occupancy classification as a hospital. Once the variance was completed and approved, the facility was in a position to be classified as part of the Mercy Hospital and Trauma Center located in Janesville, Wisconsin. The State of Wisconsin Department of Health Services Division of Quality Assurance Office of Plan Review and Inspection is primarily funded through construction application fees based on project cost and square foot of construction area. Under State statute a municipality shall not issue licenses or permits to construct prior to review and conditional approval by the State agency. The State of Wisconsin Office of Plan Review and Inspection (OPRI) is based on the single source contact model where the review authority is the subsequent field inspection representative. Regulatory staff in the OPRI is required to be licensed as architects or professional engineers. Projects are reviewed for compliance with the State commercial building code as well as the codes adopted by the Centers for Medicare and Medicaid. Completion of the review and subsequent conditional approval can be presented to the municipal authority as part of the permit application. Once permission to construct has been granted by the municipal authority having jurisdiction, the collaborative approach to inspection begins. The State of Wisconsin OPRI criteria is based on three primary phases: framing, above ceiling, and finish. It is based on this State regulatory model that a close relationship with the municipal authority having jurisdiction results in a comprehensive approach. This comprehensive approach provides owners a building that is expected to perform regarding health, safety, and welfare. Mercy North emergency department lobby. The City of Janesville Building and Development Services Division structure is based upon a "One Stop Shop" organization to facilitate expedited, yet thorough. development review and provide a single point of contact for project management. Prior to the presentation of an approved plan from the State of Wisconsin ORPI, the City needed to process site development approvals prior to breaking ground for the project. City staff assisted the development through the project review and approval process which began immediately when the project concept was presented to the City. The City required review and approval of a conditional use permit that included site design (site development, storm water, parking, landscaping, and lighting) which was completed (approved through public hearing process) in less than seven weeks. With the coordination provided by the City with ORPI, the project was underway the day after the Conditional Use permit was approved by the City. City staff recognized the need to coordinate with ORPI and immediately opened the dialogue allowing all three partners to have open communications and a free-flow of information allowing potential problems to be avoided and to allow quick resolution of issues that arose through the construction process. Few communities can manage a project in a similar manner since the one stop shop approach combines disciplines and empowers staff to be problem solvers on a daily basis. The "one stop shop" approach that the City takes is a unique approach to development review and inspection as compared to most other Wisconsin Municipalities. "One stop shop" combines the typical "planning" process with the building review and inspection processes. Staff members in charge of plan reviews are trained in site planning principles and are licensed building inspectors allowing the combination of the initial site plan review and a building review process in one process if desired by the applicant. These processes had historically been separate processes. The departmental philosophy is that the City is a "facilitator partner" in a development. That partnership approaches creates an environment where staff can be a partner by guiding the applicant where solutions can be implemented to move forward. Although inspection includes detailed minimum standards for approval, the partnership approach places the inspector in a "coaching" position which expedites corrective action and allowing the project to pass approvals. The Mercy project became an excellent demonstration of how a project can be quickly facilitated while protecting the health/safety/welfare of those who are occupants in the facility. The City of Janesville is a Council-Manager form of government with a seven member elected Council. All members are at-large and the Council President serves as the head of the Board and is appointed by the Council. The City does not elect a mayor. The City also employs a third party plan reviewer for larger building plan review (as required through an agreement with the State), but in this instance since a portion of the building was licensed as a hospital, the review for the entire building was completed by ORPI. All members of the division, with the exception of the secretary, are licensed as commercial building inspectors and residential building inspectors. The Electrical and Plumbing inspectors are specialists in each of those trades, while the building inspectors also hold plumbing inspector certifications and residential electrical inspector certifications. Commercial plan reviews that are completed in-house are reviewed by the Manager, Lead Building Inspector or the Development Specialist. The Manager and the Development Specialist also review site development plans on behalf of the City. In general, there is significant cross training within the department. The Department is funded through the General Fund of the City budget. Revenue from permits and reviews are directed back to the General Fund to offset the cost of providing the review and inspection services. Revenues created do not fully offset the cost of providing the service as permitting levels since 2007 have decreased. In general, the budgeted revenues equal approximately half of the cost to provide the service. In recent years, revenues have exceeded projections due to large projects being constructed (usually one or two), which has brought the revenue levels to within 85 percent of the costs to provide the services. The department issues approximately 2,800 permits per year for all projects with approximately 50 new home permits and 30 new commercial structure permits per year since 2008. A typical year will include approximately 1,000 commercial building permits, over 150 commercial plan reviews and several hundred residential additions or alterations. These numbers continue to increase as the economy recovers from the Great Recession. In general, the City sees the role of the Building and Development Services Division as one of facilitation. Each staff member is trained as a customer service representative as well as being trained in their areas of expertise for the position they hold. As an example, the Lead Building Inspector receives annual training for building, plumbing, electrical and HVAC inspection. In addition, the organization provides additional training as it relates to customer service. The general philosophy of the division is one of facilitation and the facilitator mindset is promoted and reinforced on a daily basis. Even during interviews for potential staff members, the organization looks for qualities in potential employees that reflect a facilitation mindset rather than persons who believe building inspection is only about "enforcement." As previously mentioned, the City employs a "One Stop Shop" approach to development review. The organization and procedures that have been established with this structure allows the City of Janesville to expedite building plan reviews and permitting faster than communities that do not combine these disciplines into one area. The structure of the Building and Development Services Division is also a marketing point when the City is courting a party for an economic development project. When Economic Development staff meets with prospects, a representative of the Division is many times present to explain the philosophy of the Division and to answer questions regarding the review process or to identify potential hang-ups or delays that may arise from review of the project or due to the nature of the activities associated with the use. This early involvement creates accountability for City staff and provides a face to face contact for the customer. Since this approach is not typical in most communities, many developers are surprised at the early involvement of the Building and Development Services staff and the early feedback reduces the potential hang-ups that may arise during the project. Our history with this approach has been positive and the Mercy North project is an example of how the facilitation approach to construction provides positive results for all parties involved in a project. 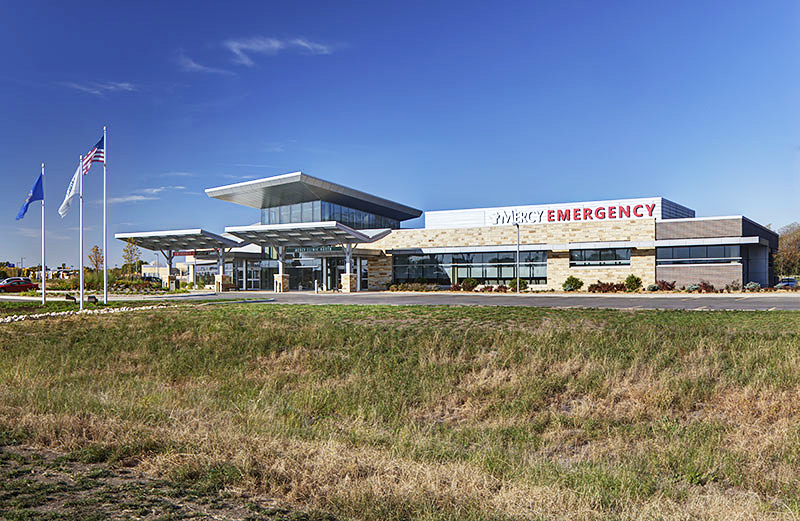 In early May 2011, Mercy Health System engaged architect/engineer AECOM for the design of a new freestanding emergency department/clinic to serve a fast-growing population on the north side of Janesville, Wisconsin. Design began on May 15th, and the design team quickly developed master plan options for the 27 acre site (literally created on the kitchen table of the lead designer over a weekend) with a mind toward smart growth strategies that would maximize the site's potential in both the short term and well into the future. These two options—with the first phase and full build-out of the site were presented to the city for approval in early June 2011. In early July, Mercy Health System approached Magill Construction Company, Inc. about partnering with them and AECOM to achieve an extremely aggressive schedule on their proposed Mercy Emergency North/Mercy Clinic North. The schedule they wanted to meet was City of Janesville approval/start of construction on 9/19/11 with completion of the project and open for business on 1/7/12—a duration of 110 days. A project of this scale and complexity would typically require a schedule of 10–12 months. With Magill on board very early in the design process, decisions regarding phasing and overall approach to design and construction could be made collaboratively and quickly. AECOM worked with Magill starting in mid-July to develop site plans and a structural steel mill order package. Meetings took place via conference call between AECOM, Magill Construction, and the mechanical & electrical team members on a weekly basis throughout the design process. The project was bid out in six different construction issues, with the first one—the earthwork, site utility and foundation package—being issued on July 29. Once the contractor understood the project scope and overall design approach, they were able to identify long lead-time items and selected suppliers for those components. The design team then worked with the product systems available from those suppliers, which included air handlers, metal panel and glass curtainwall. Details were provided in submittals from the sub-contractors, and then added to the construction documents. Shop drawings thus became a design tool which helped the architect arrive at a final design solution, rather than being submitted after design was complete. Through meetings with the City of Janesville, it was agreed that site excavation could proceed prior to the September 19, 2011 approval date—which allowed that work to start the first week of August. Once construction started on 9/19/11, the construction team of Mercy Health System, AECOM, Magill Construction, as well as the numerous subcontractors, worked seamlessly on a daily basis to stay on track with the extremely aggressive schedule. Steve Knudson and his superintendent met on a daily basis to review issues, resolutions, and construction schedule. The State of Wisconsin—specifically Henry Kosarzycki—worked with the team to divide their inspections of the building into two halves, plus an overall final occupancy inspection. Through a tremendous partnering effort by all of the team members, Mercy Health System opened their new facility for an open house on 1/7/12 and opened to see patients on 1/13/12. Once the contractor understood the project scope and overall design approach, they were able to identify long lead-time items and selected suppliers for those components. The design team then worked with the products available from those suppliers, which included air handlers, metal panel, and glass curtainwall. Details were provided in submittals from the sub-contractors, and then added to the construction documents. Shop drawings thus became a design tool which helped the architect arrive at a final design solution, rather than being submitted after design was complete. Specific to the project submittal process the "just in time" challenge of the project was met with a digital approach to document exchange. Construction documents were submitted and reviewed on the Adobe platform. Subject to State of Wisconsin statute and administrative rule plan index sheets associated directly with the digital documents bearing the original seals and signatures of the design professionals as well as the stated approval seals were maintained as part of the contract documents. Foster collaboration through trust and respect. The Mercy Clinic North was of strategic importance to both Mercy Health System and the Janesville community. Mercy recognized that to deliver a project in such a tight time frame, cooperation and buy-in of all parties was critical, and they established the framework to make that happen. Mercy directly selected trusted partners in AECOM and Magill, each of whom had successfully delivered projects for Mercy in the past. All team members collectively worked through issues to meet the overall needs of the project and the community. The level of trust the client placed in the design and construction team extended throughout the larger team, fostering an integrated and cooperative 'can-do' attitude, and helping set the stage for project success. Listen to the community. The site is adjacent to a growing residential neighborhood, and as such, the community was keenly interested in the impact of the new development on the neighborhood. Mercy held a community meeting, where site plans, shadow studies, and massing diagrams were shared with interested stakeholders. Feedback was collected and integrated into the design. Rich Gruber, Mercy's Vice President of Community Advocacy led the meeting, with Gale Price, Buildings & Development Manager with the City of Janesville on hand to answer any questions. The project subsequently was approved by the Janesville Planning Commission with no negative statements from the community about the project. Communicate, communicate, communicate. One unique aspect of the Mercy Health Partners/AECOM relationship is that a member of Mercy's facility's team is located on site in AECOM's Minneapolis office. She serves as a liaison between the design team and the owner, and is involved in the master planning, design and detailing of all Mercy projects. This on-site presence fosters real time decision making—which is of critical importance to a fast-track project. As noted previously, Steve Knudson and the team from Magill Construction, subcontractors and representatives of the design and client team worked together on a daily basis to address issues and keep the project on schedule. The project clearly addresses the community's expanded need for emergency healthcare for Janesville and the surrounding areas. The overall collaborative efforts of the owner, design staff, construction team, City of Janesville and State of Wisconsin made this timely effort a reality. "Sustainable Janesville Award" has been presented to Mercy Health System Corp. for identified green concepts incorporated into the buildings infrastructure and operation. Items identified in design, construction, and operation included renewable energy and efficiency, solid waste minimization and recycling, use of renewable resources, water conservation, environmental policies in place and in practice, along with other sustainable issues.